Home >> Components & Installation Supplies >> Valves, Fittings and Tubing >> Elbow Check Valve 1/8" x 1/4"
1/4" x 1/8" Elbow Check Valve for the RO effluent in RO Systems. 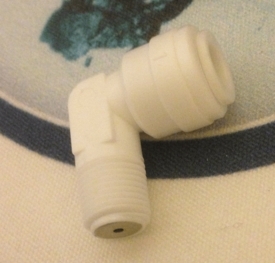 Check Valve Thread 1/8 inch and 1/4" quick connect fitting for the tube. It allows water flow in one direction only protecting the membrane from back pressure.